This is one of the most peaceful Christmas songs that is so simple, but elegant. The melody just takes you into a peaceful state and different dimension as it tells its story. I find when I play this song, I try to keep it very simple and not let the music distract from the song. One of the things that I find interesting is that it is either spelled Noel or Nowell and both is correct but it depends on the year the music was written. Track #4 of 15 songs on Christmas Piano. Noel can mean either Christmas or Christmas carol. Sometimes it is spelled Nowell. 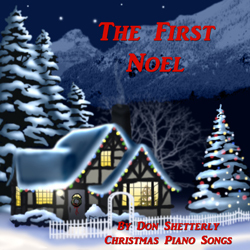 The First Noel Christmas song comes from the 16th or 17th century. Sir John Stainer, an English composer and organist is said to have created the present day version that we sing today. It was first published by William Sandys in 1833. Noel is actually a French word that comes from the Latin word, Natalis. Natalis means birth and so the First Noel is the first birth or a song about Jesus being born. An English carol that was a custom for the village people to sing while they brough in the Yule Log on Christmas Eve. The Yule Log was burned to symbolize the triumph of light over darkness, especially when the winter days were so short, but the winter nights were long. In fields where they lay keeping their sheep, on a cold winter’s night that was so deep. And there it did both stop and stay, Right over the place where Jesus lay. And offered there, in his presence, Their gold, and myrrh, and frankincense. That hath made heaven and earth of naught, And with his blood mankind hath brought. Nowell, Nowell, Nowell, Nowell, Born is the King of Israel.